Situated on a hillside, the Sunset Villa gives you a perfect view over the calm lagoon between Le Morne and Black River. It is situated near the surf spot of Le Morne Brabant (4 kms). Come and enjoy the splendour, the beauty and the hospitality of the Paradise Island of Mauritius at a very affordable price. Rent an appartment or a bungalow with Sunset Villa on the magnificent western coast of Mauritius at La Gaulette. You will right in the heart of a family life where you can discover the local traditions, culture and cuisine. We also arrange car rental and your transfer from the airport! 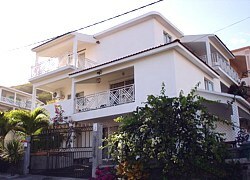 3 bedrooms, 1 large living room, 2 terraces with sea view, 1 bathroom and 1 kitchen fully equipped. 1 bedroom, 1 Open room with 2 sleeping places, 1 living room, 1 bathroom, 1 terrace, and 1 kitchen fully equipped including a beautiful garden. Rate: Euro 40 per night (maximum 3 persons also suitable for a couple with 2 kids). Option 3: The two apartments together/ Combination of options 1&2 above. 4 Bedrooms, 1 Open room, 2 living rooms, 3 terraces with seaview, 2 bathrooms, 2 kitchens fully equipped with a garden with a local touch. Rate: Euro 85 per night. Free services: Daily cleaning (except sundays) and towels, bed sheets and blankets are provided. Paid Services: ADSL Internet facility at Euro 10 per week.